Image Source: ourdocuments.gov Lamps are the essential part of any luminaire. These are the light generating components. 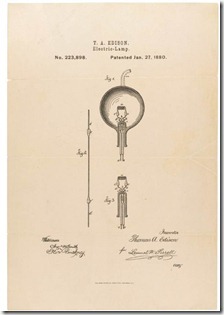 Since the advent of electrical lighting in the middle of the 19th century, multiple types of lamps have been developed. Over the years lamp technology continues to evolve offering increases in performance and efficiencies. Electricity heats a filament until it is incandescent (around 2800 K). General Lighting Service Lamp, GLS - designed for general lighting service with tungsten filament surrounded by inert gas and enclosed in a glass bulb. Ionisation of a gas (or metallic vapour), initially by the application of an high voltage pulse followed by charged particles colliding with atoms. This causes radiation to be given off. Recent drives to create more efficient and environmentally friendly lamp technology has see much research and development in the fields of LED and Induction Lamps. LED (Light Emitting Diode) - electric current flowing through a semi-conductor junction cause light to be emitted.